We are often asked this. So here’s a snapshot of a day at Campus Life. We are in five schools through Campus Life. This blog post specifically features activities at Auburn High School. On Thursdays, our leaders kick off the afternoon by hanging out with teens during the Early Release hour. While some students depart, many students remain on campus in the cafeteria. We engage them through games, conversations, and ultimately relationship-building. Students then gather with our leaders in the library, where Campus Life occurs. Food, laughter, games, and focused conversation on Christ and life are all regular components of Campus Life. On a recent Thursday, our leaders discussed healthy boundaries with students and the value of relationships. 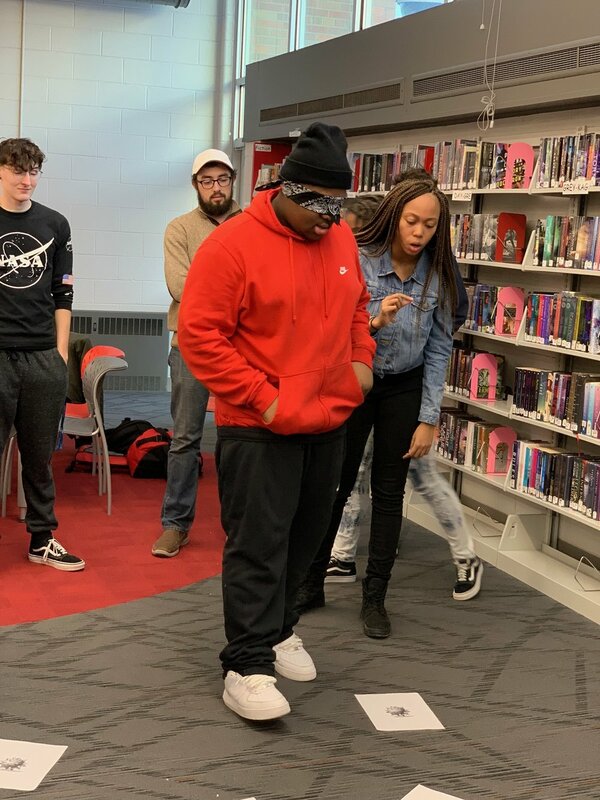 They did a fun exercise involving a maze and blindfolded participants. The maze featured pieces of paper with an “exploding bomb” printed on them that they were to avoid. Each participant had a partner, who was the only voice that could help guide them through the maze. To make it harder and more confusing, other students were allowed to get really loud to distract. This presented challenges! The exercise demonstrated that communication is often torn in friendships and relationships. Sometimes we listen to the wrong voices. We need to block out distractions and only listen to one voice. Learning such skills leads to developing healthy boundaries within relationships and the ability to discern which voices in one’s life are healthy. Such activities foster deeper relationships between our leaders and the youth. Moreover, it’s our consistent presence within schools that highlights God’s love. The presence of loving leaders point youth to God’s voice and His grace and mercy found in Jesus Christ. This is Campus Life. Contact us about getting involved!